“I came out to see why you were laughing,” she said. I was riffling through the pamphlets box on the pavement outside the curio shop in Tewkesbury. All along the High Street were heraldic banners, as if King Arthur’s knights were assembled here for a tournament and a meeting of the Table Round. Next item on the agenda; the appearance of the Holy Grail. I showed her the brochure. Royal Botanic Gardens Kew. 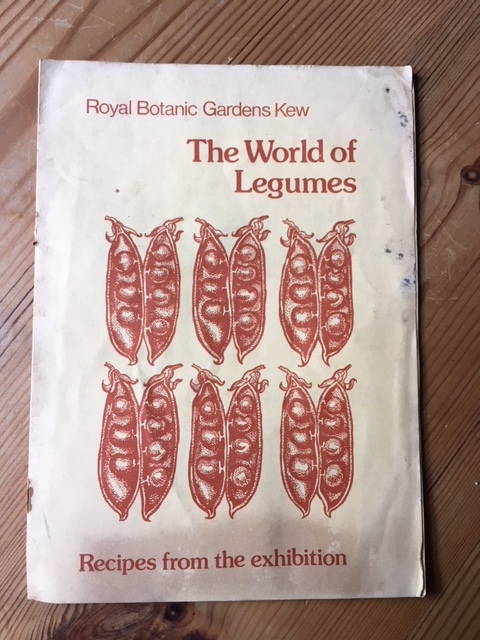 The World of Legumes. Recipes from the exhibition. “Beans,” I said, not exactly correctly. 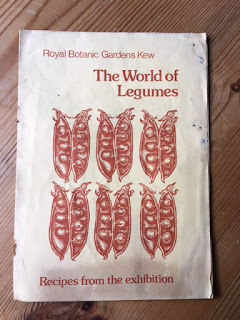 All the recipes had titles taken from the Latin botanical names of the legumes used. It would certainly make restaurant orders more interesting. Arachis hypogaea turns out to be Peanut Soup from the West Indies. It has Tabasco, Angostura Bitters and Dry Sherry in it. This sounds promising. The booklet is from a more innocent time. Hands-across-the-world, we’re-all-in-this-together, human beings each with our own beans, let’s share them. Recipes for Red Beans from Cuba (what else? ), Black Beans from Brazil, Peas and Lettuce from France, Dwarf Beans from Turkey. But I was already resuming my search. Always look at the pamphlets. A motto for book collectors. Especially those of an antiquarian disposition. You never know what you’ll find. I’ve got hundreds of them back at home, in the staunch cardboard boxes of the Imperial Tea Company of Lincoln, still redolent of Yunnan Gold, Sikkim Temi, Georgian O P, Rain Garden Darjeeling. A few more things come to hand. “Those historical ones,” the lady says, “will have to be £2 each. They’re quite old.” I nod. Why not? What can you get for £2 these days? 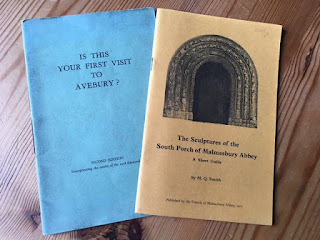 The Sculptures of the South Porch of Malmesbury Abbey, A Short Guide, 1975. By M.Q. Smith. You rather wish you had Q as an initial. It’d look good on a cricket scorecard. England vs the Rest of the Universe, in the year 2525. M.Q. Valentine, 159 not out. I wonder what it stands for? Must be Quentin, surely. Quintillian might be pushing it, Quincy best reserved for Western gunslingers. MQS worked at the History of Art, Bristol University. He’s got form: an earlier monograph on The Medieval Churches of Bristol, 1970. What happens when you join all those churches up? Two epigraphs on the inside cover. Psalm LXXXIV, i. “I had rather be a doorkeeper in the house of my God; than to dwell in the tents of ungodliness.” And “Oh enter then his gates with praise! Approach with joy his courts unto . . .”. W. Keithe, 1561. 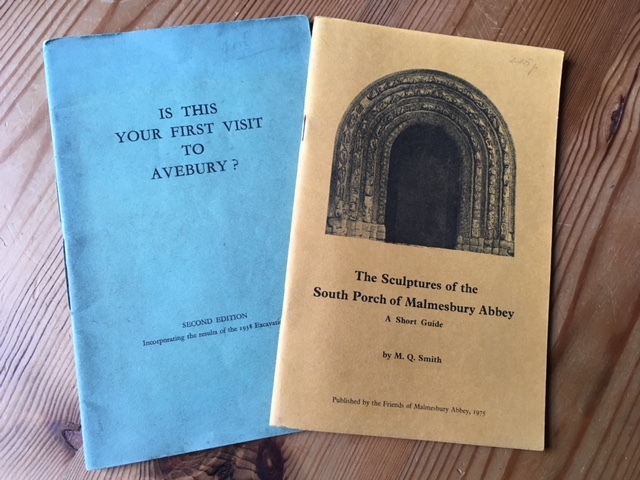 My book-browsing companion Mr Howard points out to me that M R James is cited as one of those earlier sources, as the author of On the Sculptures of the South Portal of the Abbey Church At Malmesbury. Proceedings of the Cambridge Antiquarian Society X (1900-1901). So what is it about the South Entrance that has drawn MRJ and MQS to it? Richly carved emblems all around the Romanesque arch. Adam and Eve and The Fall. The Expulsion from the Garden. Noah and the Flood. The Prophets. The Three Magi. The Psychomachia, or The Virtues Conquering the Vices. The monograph provides a fold-out key at the end which suggests interpretations for some of the other symbols. There might be Fishes for Pisces, a Seated Figure With a Viol, a Dancer, Peacock, Somersaulter, Two Rams. But five signs seem quite irretrievable and many are uncertain. A lost English Almanac of the seasons and the stars, perhaps. There is much else of singular and curious interest in the booklet. Is This Your First Visit to Avebury? asks another pamphlet in pleasing sage-green wrappers. By D. Emerson Chapman. Second Edition, Incorporating the results of the 1938 Excavations. A spurt of English bloody-mindedness at once leaps up. Mind your own business, you want to say. But it’s worth looking inside. It’s written with breezy confidence, the avuncular assurance of the Public Information Film, perhaps with that jolly Puffin’ Billy tune playing in the background. And it’s published by The Morven Institute of Archæological Research (that conjoined a and e so reassuringly archaic), which sounds like something that might have been set up by Professor Quatermass. The prose is beautifully lucid and straightforward and says exactly what we know pretty certainly, and what we don’t know at all, and probably never will. I once stayed in a bed and breakfast in the village of Avebury, inside the circle. The tranquil night was torn by eldritch shrieks; the peacocks in the manor gardens. This succinct and readable piece of Old Aveburyiana is certainly worth having. Following the curio shop, it’s into the backstreets. There’s a sign for a ferry. And flood-marks on the walls, shoulder-height. Very soon you’re up against the Severn, lapping complacently in the hot sun. There’s a sort of serpentine murmuring, in an unknown tongue, older than Avebury. But its meaning is clear enough. "I know the signs," it seems to say, "I know the seasons." There ain't half been some clever blokes - didn't someone say summat like that? Ian Dury maybe? You are certainly among them, M.Q.V.! My late friend the Crowley collector and bookseller Nick Culpeper was once asked by a trumpeter pal if he could get him something on breathing techniques to help his playing. Rummaging in the box of pamphlets in a shop he noticed the handwritten occult pseudonym of Kenneth Grant, Aossic, on a pamphlet on yoga breath exercises. Closer inspection showed it had been annotated by Grant's master Aleister Crowley. A snip at two quid. I asked if he gave it to his friend. "Well, I gave him a photocopy" he said. Magic fingers he had. Utterly delicious piece of prose, Mr. V., but Q would make you sound rather too much like an associate of James Bond. This is a very good look for you! These are all a vast improvement on "The Dictionary of Hammond Organ Stops", which I found last weekend and declined at a tenner. Wonderful. Yes, I recently came away from a book fair empty-handed, having decided against 'A Hundred Years of Road Rollers'.